Bright red, orange, green color tie down strap. Trailer tie down / cargo extender is the best automotive deal on Amazon among metal buckle straps. The heavy-duty tie downs ratchet is perfect for securing small and medium cargo on your vehicles if you can't use lashing straps hooks. This tie down connector is great for securing a box, home furniture, bags, sack, ski, outdoor sport accessories, sup surfboard tie-down, boat trailer tow strap. Thick polyester tie down with metal cam lock buckle webbing safely transport your luggage, cargo bag. The metal tie down with clamp cam lock buckle has a simple ratcheting system. Steel strap is sold in 3-packs. Protect your cargo during transport with this strap hardware! No hook, clips or belts needed when you use this tiedown. WARNING: Do not exceed Working Load Limit of 200 lbs for this cover tie down. Check load and carry strap before and during transport. Kayak tie downs / boating tie downs are not to be used for lifting, personal restraint or construction. FAILURE TO COMPLY WITH WARNINGS MAY RESULT IN PERSONAL INJURY OR DAMAGE OF PROPERTY. Start your great adventure now! But remember that security is number one priority. ✅ STRONG & STURDY TIE DOWNS: Tie down kit of 3 sizes: 4.7, 9.3 and 13-foot-long by 1-inch wide of secure car tie downs tights your load securily. Working load limit up to 200lbs, breaking strength - up to 600lbs.  VERSATILE & RELIABLE KEEPER: Cargo strap provides a safe transportation on your vehicle car roof cargo rack for a 8ft kayak, canoe, sup surfboard tie-down. 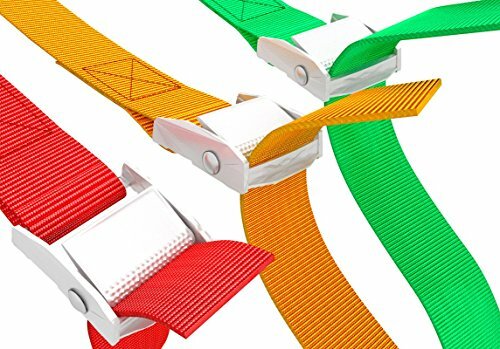  SAFE & EASY USAGE: These red, orange, green tie down help you to drive a jeep, suv or truck like a pro thousands of miles - no worries about a heavy load. Trailer tie downs have an extra easy installation unlike a rope. ✅ HIGH-QUALITY MATERIAL: Kayak tie down is made of 100% polyester for lifting auto heavy duty equipment. The cambuckle is made of a zinc fusion - the buckle stays shiny and corrosion resistance. No flimsy plastic.  RISK FREE PURCHASE: We use these easy tie down for fastening our cargo as well. But if you're not 100% satisfied with your cargo tie down, we offer you a refund or replacement. If you have any questions about this product by WowThings!, contact us by completing and submitting the form below. If you are looking for a specif part number, please include it with your message.